With the exception of a few vacation rental home communities, Carova still remains virtually as wild and untamed as it was a century ago. As a result, vacationers and explorers are rewarded with miles of undisturbed shoreline, as well as some of the best birding, fishing, boating, hunting, hiking, and nature photography that the Outer Banks has to offer. This lack of development on Currituck's most northern beaches was actually intended, and was a result of a small handful or reserves, parks, and refuges popping up along the northern shoreline. The largest of these protected parcels is the Currituck National Wildlife Refuge. This refuge is so large that it actually takes up six separate components in the ten-mile stretch of beach between Corolla and the Virginia border. Each section of land has its own unique characteristics and habitats, and each is wide open to the public to explore. Spanning from the Atlantic Ocean to the Currituck Sound, and encompassing acres of maritime forests, sand dunes, and shrub thickets in between, the Currituck National Wildlife Refuge is a whopping 4,570 acres total, making it one of the largest refuges along the Outer Banks barrier islands. Facilities may be limited around these parts, and vacationers certainly won't find the bevy of restaurants, shops, and attractions that the neighboring town of Corolla has in spades. However, visitors to the refuge simply fall in love with its beauty, its undisturbed wildlife, and its miles of clear blue shorelines. For a day trip that's packed with natural adventure and some of the Outer Banks' best scenery, take a self-guided tour through the Currituck National Wildlife Refuge on your next Outer Banks vacation, and see what all the fuss is about. For centuries, the majority of the Outer Banks resembled the way many portions of Carova are now - barren and unpopulated areas of sand dunes, oceanfront beaches, and dense maritime forests. Tourism began to trickle into the central Outer Banks towns of Nags Head, Kill Devil Hills and Kitty Hawk in the early 1930s and 1940s, but even before the Outer Banks became synonymous with vacation destination, wealthy adventurers flocked to Corolla and Carova for the fantastic hunting and fishing. Getting there was quite the adventure in and of itself. There were no paved roads along the northern Outer Banks until the 1960s and 1970s, so these vacationers had to either commission a local hunting guide to trek them up the beach to the best fishing and hunting spots, or attempt to navigate their vehicle through miles of sandy tracks, muddy ditches, and uneven paths that ran through the dune lines. Once they arrived, however, these vacationers fell in love with the incredible wildlife and completely untamed nature of the islands, and a handful set up full-time residences. The Whalehead in Historic Corolla, one of Corolla's most famous attractions, was one of the first such "hunt clubs" to be established on the island. By the time NC Highway 12 was finished, however, running all the way to the northern edge of Corolla, the secret was out and scores of vacationers headed north to enjoy some of the Outer Banks' best beaches. In all the commotion, new developments of vacation rental homes, condos, hotels, restaurants, and shops started to spring up throughout the village, and locals, (as well as the state and federal government), began to worry about the future of the natural condition of the area. This was compounded by the effect of development on the world-famous Corolla Wild Horses, a centuries-old breed of feral mustangs that date back to the Spanish shipwrecks of the 1500s or early 1600s. As more vacationers headed to Corolla, more wild horse casualties occurred, with a number being injured or even killed by the increasing vehicular traffic. The wild horses were subsequently moved north, and a wooden fence was erected around the Carova borders to keep them from investigating the busier, paved streets of Corolla. After these large parcels of land were sectioned off, developers soon realized that the eventual goal to extend NC Highway 12 all the way to the Virginia Border could never come to fruition, as it would require huge easements through several large tracts of government-protected reserves and refuges. The end result is the Carova of today that rustic, nature-loving vacationers adore. Accessible only by 4WD vehicles, with no commercial businesses in sight, the ambitious partition of several exceptionally large tracts of land have allowed occasional vacation homes to pop up here and there on the outskirts of the refuge, but still lets the northern Currituck Banks be a completely wild destination. Because of the sheer size of the refuge, visitors will find they have plenty of areas to explore, all spread out throughout the island, and bordered by small clusters of residential and vacation home communities. At 4,570 acres total, the refuge is further divided by clusters of woods, beaches, and marshes in between. To summarize, the U.S. Fish and Wildlife Service estimates that the refuge consists of 2,033 acres of wetlands or marshes, 778 acres of wooded forests, 874 areas of brush, and 418 acres of beaches. The first section of the refuge is located just north of the Currituck Banks Coastal Estuarine Reserve, and stretches from the ocean to the sound. Another parcel is found not too far away, hugging the soundfront, and yet another parcel is located at one of the islands' widest points, consisting of shoreline, maritime forests, and even a cluster of small, marshy islands on the soundside. Several smaller sections are located throughout particularly dense patches of maritime forest or marshes along the borders of Ocean Beach and North Swan Beach. The last section is located next to the Virginia Border, and also consists of a series of small islands and popular fishing spots, including Oyster Cove, NW Pond, Wishes Hammock, Herring Cove, and Set Net Creek. This incredible collection of habitats, broken up only by a few residential communities here and there, provide virtually every kind of Outer Banks environment, from the marshlands, to the big patches of maritime woods, to the mud flats and grassy dunes, to both sound and ocean beaches. While a number of reserves and refuges on the Outer Banks boast similar habitat varieties and environments, the Currituck National Wildlife Refuge is especially unique in that it is one of the few locales on the Outer Banks that has small, wooded islands. Monkey Island, located in the northern section of the refuge, is an especially recognized area for its lush nesting grounds for a variety of migrating and wading birds. Visitors here, (which usually travel to the area by a kayak or small skiff), will be amazed to find towering loblolly pines and cedars just yards away from the watery borders. Regardless of whether you travel to the island by foot or boat, however, each unique habitat is certainly worthy of exploring in depth, even if your definition of "exploring" is taking a stroll in search of the wild horses, or lounging on an oceanfront beach with a good book in hand. Obviously, the most famous attractions of the Currituck National Wildlife Refuge are the wild horses, and they can be spotted matriculating throughout the various parcels, and occasionally even popping by the neighboring communities to munch on a little backyard grass. But the Corolla Wild Horses aren't the only animals who call the Currituck National Wildlife Refuge home. In fact, visitors will find a wide range of reptiles, fish, plant life, and mammals around every sand dune and unmarked trail. Vegetation within these diverse habitat types, from the thick woods to the sandy beaches, include various types of beach grasses, live oaks, loblolly pines, wax myrtle, cattails, sedges and rushes, black needlerush, and giant cordgrass. Visitors to the wooded section should especially be on the lookout for the live oaks, some of which are hundreds of years old and have stood on the Currituck Banks for as long as the wild horses have called the area home. The marshy and wooded areas of the reserve also attract a number of reptiles and amphibians, including the southern leopard spotted frog, tree frogs, box and snapping turtles, and even several varieties of snakes, (particularly in the dense, wet areas of the brackish sound marshes.) One of the most famous amphibious creatures, however, only visits the refuge for a night or even for just a couple of hours - the loggerhead turtle. The endangered loggerhead turtle often picks stretches of the quiet and undeveloped Currituck Beach to scuttle ashore and lay their eggs, heading back to the open ocean waters as soon as the task is complete. Refuge "Turtle Patrols" regularly scout the area daily during the sea turtle nesting season, generally from mid-spring until late fall, for new sandy evidence of recently laid turtle eggs. Once spotted, the areas are partitioned off from human traffic to ensure the eggs are protected and can properly mature, and in a few weeks' time, the turtles eventually hatch and make a mad dash back to the ocean. While an actual loggerhead turtle spotting is extremely rare, avid birders will find they'll have plenty of luck finding rare and exceptional species throughout the refuge. With little development and hundreds of acres of room to roam, the refuge is one of the best locales for birds on the Northern Outer Banks, from the dense sand along the ocean wash to the tall grassy marshes of the Currituck Sound. The Outer Banks is also an essential part of the "Atlantic Flyway," the migratory route for birds flying north to south and vice versa, and as such over 300 species of birds can be found in these areas at any given time of year. Visitors can expect to see a number of wading birds, shorebirds, and waterfowl while touring the site, including Canadian geese and ducks, white swans, ibises, osprey, egrets, and occasional great blue herons. In addition, the area is known as a habitat for the threatened piping plover, a small shorebird that resembles a sandpiper and sticks to the beaches close to the ocean wash.
A number of mammals also inhabit the refuge, which lends to its reputation as home to some of the best hunting grounds on the Outer Banks. These mammals include scores of deer, raccoons, squirrels, and rabbits, and though they may be hidden to a casual visitor, they are plentiful in the refuge, particularly in the dense thickets of shrubs and the maritime forests. All in all, wildlife lovers will have their best chance of spotting the islands' wildest of natives by taking a quiet self-guided tour of the Currituck National Wildlife Refuge, where every habitat boasts an entirely new set of inhabitants to uncover. Part of the raw charm of the Currituck National Wildlife Refuge is that it is so difficult to get to, making an exploration of the wild habitats a true expedition. After the paved NC Highway 12 ends in Corolla, refuge visitors must travel along the beach in a 4WD vehicle to access even the refuge borders, which are located about three-quarters of a mile off the main paved road. Small signs mark their existence, but visitors will find no established trails throughout the refuge - just a couple small sandy paths that were haphazardly established by decades of visitors on the soundside. This is an intentional design, as the lack of organized trails and boardwalks allows the wildlife of the refuge to thrive. Many visitors staying in Carova will find themselves in rental homes that are adjacent to the refuge's borders, meaning that the Currituck National Wildlife Refuge is literally in their back yard. This makes exploring a little easier, certainly, as it only takes an afternoon or evening stroll to explore the sandy dunes and wooded maritime forests in the heart of the refuge. Day-trippers have the option to simply park along the oceanfront, well outside the established sand tracks that run the length of the island, or seek out the small, sandy parking areas that are located in Ocean Beach, approximately 1 mile off the main paved road on the soundside. Three additional parking areas are located in Swan Beach and North Swan Beach, behind the residential communities, and providing easy access to a refuge big game hunting area. Most of the exploring through the refuge will have to be on foot. Though visitors are free to drive up and down the beaches, or through the privately owned soundside communities, 4WD vehicles and ATVs are not allowed in the refuge. Visitors will find that a thorough exploration of the refuge, (off the oceanfront beaches, of course, which are easily accessible), will entail parking and strolling west, towards the thickets of shrubs, forests, and soundside habitats. Perhaps one of the best ways to navigate through the refuge, (especially for avid fishermen), is by boat or kayak. While there are no public boat ramps located within the refuge on the Currituck Banks, avid boaters will find plenty of launching points on the mainland of Currituck County and on adjacent Knott's Island. From here, it's just a quick trek across the Currituck Sound to some of the most scenic small islands, thick marshes, and exceptional hunting and fishing locales. Brumley Landing, a public boat launch that's located on Knott's Island and is next to the Mackay Island National Wildlife Refuge, offers a direct route to the soundside portion of the refuge, and is one of the closest boat launches available for Currituck National Wildlife Refuge visitors. Clearly, the Currituck National Wildlife Refuge isn't the easiest park, reserve, or refuge to get to on the Outer Banks, but avid visitors love it that way. With acres of protected landscape to explore, and few other humans in sight, a trip to the Currituck National Wildlife Refuge is truly a step back in time to the Outer Banks of centuries ago. Don't have a 4WD vehicle or access to a boat? Consider booking a wildlife tour. A handful of tour companies operate out of Corolla and take visitors on guided excursions through the 4WD areas of Carova in search of the elusive wild horses. Visitors can opt to hop on a 4WD "bus" and ride along as passengers, or commandeer their own Jeep as part of a guided vehicular tour. Reservations are strongly recommended, as the local tours fill up fast, especially in the busy summer months. Visitors who are planning a summer visit should make bug spray a top priority on their list of things to bring, especially if they plan on accessing the marshy sound areas of the Currituck National Wildlife Refuge. If sticking close to the oceanfront, where the steady stream of ocean breezes keeps mosquitos at bay, bug spray may not be needed, but sunscreen certainly will. Refuge visitors will also want to bring plenty of water and snacks, as once the paved road ends and the sandy tracks begin, there are no public facilities, convenience stores, or commercial businesses of any kind. For a thorough exploration of the Currituck nature scene, consider a day trip to the Mackay Island National Wildlife Refuge. This refuge is actually the "parent" refuge of the Currituck National Wildlife Refuge, and is located just across the sound in mainland Currituck County. Here, visitors can experience the vast wildlife of Coastal North Carolina from an entirely different point of view. If you find yourself completely enamored with the deserted beaches and wild landscape of the Currituck National Wildlife Refuge, then consider a week-long vacation in the area. Several northern Outer Banks vacation rental companies represent rental homes in the area, and with some of these properties boasting private pools, hot tubs, game rooms, and even authentic theater rooms, a "rustic" vacation never looked so good. Hunting is allowed within the refuge, however certain parcels allow certain types of hunting. (For example, the Swan Beach parcels allow big game hunting only, while the soundside Carova Beach region only allows waterfowl hunting.) Hunters can get more information on required permits, hunting seasons, and area regulations at the Currituck National Wildlife Refuge's website, http://www.fws.gov/currituck/, or by stopping by the administrative office at Mackay Island National Wildlife Refuge located on Currituck County. Want to learn more about the National Wildlife Refuges of the Outer Banks? A new Visitors Center was opened on Roanoke Island in June of 2012 that has countless exhibits on the refuges' goals and wild inhabitants. Located on US 64, opposite from The Lost Colony drama, the refuge's Visitors Center is open daily from 9:00 a.m. to 4:00 p.m. and only closes for Thanksgiving and Christmas. There's also a gift store and book shop on premise, so birders and wildlife fans can pick up a couple local guide books on the area. For more information, visit the Visitors Center website. Visitors to Carova are a salty and hardy bunch that treasure undeveloped beaches and undisturbed wildlife, and thanks to the Currituck National Wildlife Refuge, this stretch of coastline will remain wild for years to come. Vacationers who are cruising along the 4WD accessible northern shoreline may not even notice where the oceanfront portions of the refuge end and the small village communities of Carova begin, but really, that's all part of the charm. With over 4,000 acres to explore, and some of the best fishing, hunting, birding, and photo opts that the Outer Banks has to offer, visitors who love a natural retreat will be happy to flock to the Currituck National Wildlife Refuge, whether it's for a day, a week, or even a lifetime. Where is the Currituck National Wildlife Refuge? The Currituck National Wildlife Refuge is located in the northern Outer Banks, and is comprised of six separate parcels that extend from the town of Corolla to the Virginia / North Carolina state line. How do you get to the Currituck National Wildlife Refuge? The easiest way for Outer Banks visitors to reach the majority of the Currituck National Wildlife Refuge is to head north on Highway 12 until the paved road ends. From there, visitors can use a 4WD vehicle, (or enjoy a long walk along the beach), to reach the varying parcels of the refuge. There’s also a small parcel of the refuge and the Currituck Banks Coastal Estuarine Reserve that’s located on the borders of Corolla, off of Ocean Trail and North Beach Access Road. Boaters can also access the Currituck National Wildlife Refuge via numerous boat ramps in Currituck County, like Brumley Landing on Knotts Island. Is there parking at the Currituck National Wildlife Refuge? A small paved parking area for the Currituck Banks Coastal Estuarine Reserve and the southernmost components of the Currituck National Wildlife Refuge is located in the town of Corolla, along Ocean Trail and North Beach Access Road. 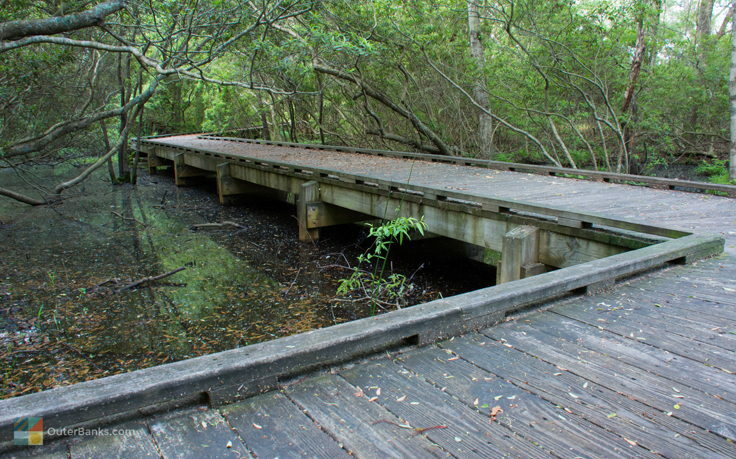 Other northern areas of the Currituck National Wildlife Refuge have rustic parking areas, and a 4WD vehicle is required to reach these refuge components. Do you need a 4WD vehicle to get to the Currituck National Wildlife Refuge? A 4WD vehicle is recommended to reach the majority of the Currituck National Wildlife Refuge, as most of the refuge is located in the Carova region of the northern Outer Banks where there are no paved roads. These is a small parking area and nature trail in the northern region of Corolla, adjacent to the Currituck Banks Coastal Estuarine Reserve, where a 4WD vehicle is not required. Can you camp in the Currituck National Wildlife Refuge? Camping is not allowed anywhere within the Currituck National Wildlife Refuge. Are there special events at the Currituck National Wildlife Refuge? The Currituck National Wildlife Refuge has a number of educational events throughout the year, and the site also participates in the annual Wings Over Water festival in October. During this week-long event, there are a number of guided hiking, boating, and / or other excursions within the refuge. Where can you stay at the Currituck National Wildlife Refuge? There are several hundred vacation rental homes that border the Currituck National Wildlife Refuge and which are located in the 4WD area of the Outer Banks. These homes can range from 2-3 bedroom cottages to 12 bedroom or more homes, and are scattered throughout the northern Outer Banks area. Are there restaurants near the Currituck National Wildlife Refuge? There are a number of restaurants located in the town of Corolla, which is just south of the refuge, however there are no restaurants in the 4WD Carova region, where the bulk of the Currituck National Wildlife Refuge is situated. Are there restrooms at the Currituck National Wildlife Refuge? There are no public restrooms located within the Currituck National Wildlife Refuge. Are there mosquitos at the Currituck National Wildlife Refuge? Are there snakes at the Currituck National Wildlife Refuge? There are snakes in the Currituck National Wildlife Refuge although they are generally shy and avoid humans. Nevertheless, visitors should be on the lookout for copperheads and water moccasins, which are the two most common poisonous snakes in the Eastern North Carolina region. 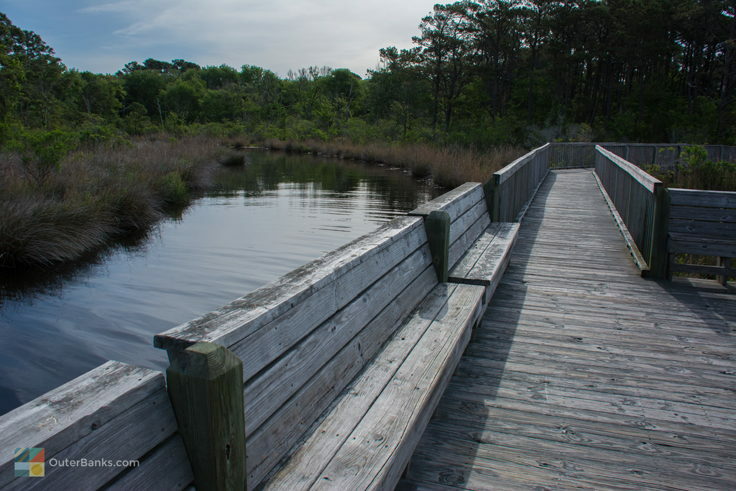 Are there hiking trails at the Currituck National Wildlife Refuge? The majority of hiking trails within the Currituck National Wildlife Refuge are rugged and relatively unmarked. However, miles of trails exist in the 4WD area of the Northern Outer Banks for adventurous visitors who want to explore. There’s also a roughly .5 mile and 1.5 mile long trail in Corolla next to the Currituck Banks Coastal Estuarine Reserve, in the Ocean Hills area, where Ocean Trail turns into North Beach Access Road. Where are the birding spots at the Currituck National Wildlife Refuge? There are countless unmarked trails in the 4WD area to find various species in the maritime forest, marshes, and open sound waters. The open shorelines are also fine spots to catch a number of shorebirds, such as gulls, terns, sanderlings, and plovers. How large is the Currituck National Wildlife Refuge? The Currituck National Wildlife Refuge is about 4,500 acres in area, which includes wooded forests, brush, wetlands, marshes, and beaches. What kind of birds are in the Currituck National Wildlife Refuge? There can be hundreds of varying species of birds found within the Currituck National Wildlife Refuge. Species of note that are popular with birdwatchers include the seasonal tundra swan, the tree swallow, the Savannah sparrow, aanderling, piping plover, osprey, great egret, least tern, and common loon. What is the terrain like at the Currituck National Wildlife Refuge? The terrain of the Currituck National Wildlife Refuge is typical of a barrier island landscape, and includes beaches and dune grass, maritime dry grassland, maritime shrub thickets, wetlands and brackish marshes, and maritime forest. Are there wild horses at the Currituck National Wildlife Refuge? Because the majority of the Currituck National Wildlife Refuge is located in the 4WD region of the northern Outer Banks, visitors are likely to spot the famed wild horses of Carova within the refuge. How can you see the wild horses at the Currituck National Wildlife Refuge? Visitors can often spot the wild horses along the beaches, or in the dunes that border the shoreline. Wild horses have also been spotted in wooded neighborhoods all along the 4WD area of Carova. Can you pet or take photos of the wild horses at the Currituck National Wildlife Refuge? It is illegal to approach and pet the wild horses, however visitors are free to take photos provided they remain at a safe distance that is at least 50’ feet away. Can you boat or kayak at the Currituck National Wildlife Refuge? Mariners are free to kayak or boat around the Currituck National Wildlife Refuge, but should note that there are no public docks in the 4WD area of the refuge in the northern Outer Banks. There are, however, boat ramps across the sound at Knotts Island and other mainland Currituck County communities. When is the best time to visit the Currituck National Wildlife Refuge? Frequent visitors attest that the late fall, winter, and early spring months are the best time to visit the Currituck National Wildlife Refuge, both because of the lack of humid weather and mosquitos, and because of the increased traffic in wintering waterfowl and migrating species of birds. Can you fish at the Currituck National Wildlife Refuge? Fishing is allows throughout the Currituck National Wildlife Refuge per state regulations. Anglers will want to remember that a North Carolina Saltwater Fishing License is required for fishing in any body of water along the Outer Banks, including surf fishing in the Atlantic Ocean, or fishing in the Currituck Sound. Can you hunt in the Currituck National Wildlife Refuge? Hunting is seasonally allowed in the Currituck National Wildlife Refuge, in accordance with all state and federal regulations, and a permit is required. For more information on hunting and regulations, see the refuge’s online brochure at https://www.fws.gov/southeast/pdf/regulations/currituck-national-wildlife-refuge-hunt.pdf. When is the Currituck National Wildlife Refuge open? The Currituck National Wildlife Refuge is open year-round to visitors, from sunrise until sunset. Can you bring your pet to the Currituck National Wildlife Refuge? Dogs are allowed within the Currituck National Wildlife Refuge, provided they are on a leash at all times. Can you have a fire at the Currituck National Wildlife Refuge? Fires, littering, and camping are all prohibited within the Currituck National Wildlife Refuge. Are fireworks permitted within the Currituck National Wildlife Refuge? Fireworks are prohibited throughout the Currituck National Wildlife Refuge.